[San Jose, CA] – Asian Americans for Community Involvement (AACI) is pleased to announce Sarita Kohli as President and CEO. Sarita has been a pivotal part of AACI for nearly 14 years and most recently served as the Interim President and CEO for the past 11 months. “After an extensive search of qualified candidates, we are excited that Sarita will continue her service to AACI and the community as the new President and CEO. Her dedication and passion to providing health and wellness services to communities in need, coupled with her business acumen makes her the ideal person to lead AACI into its next chapter. She has a proven track record at AACI, and we are confident that she will chart a successful path for AACI as they expand their services to more communities,” said Hanley Chew, Chair of AACI’s Board of the Directors. Ms. Kohli has been extensively involved in AACI and the community. Starting in 2003, she joined AACI as the Program Coordinator for the Center for Survivors of Torture, and quickly ascended to become the Director of Mental Health and Community Programs in 2005. She eventually served as Executive Vice President from 2014 – 2016. During her tenure, she has provided clinical services, created and expanded mental health and community programming, secured funding, and set the business strategy. In 2011 she was appointed by Governor Brown to the California Board of Behavioral Sciences, and is currently serving her second term. The Behavioral Sciences Board oversees all regulations, clinical licensing, and consumer protections for behavioral therapists in California. Locally, she has served on the Board of Directors for West Valley Community Services, served as a Commissioner on the Santa Clara County Social Services Advisory Commission, Vice President of the Behavioral Health Contractors of Santa Clara County, and a member of the Intimate Violence Task Force. She was honored in 2015 as a Woman of Influence by the Silicon Valley Business Journal. 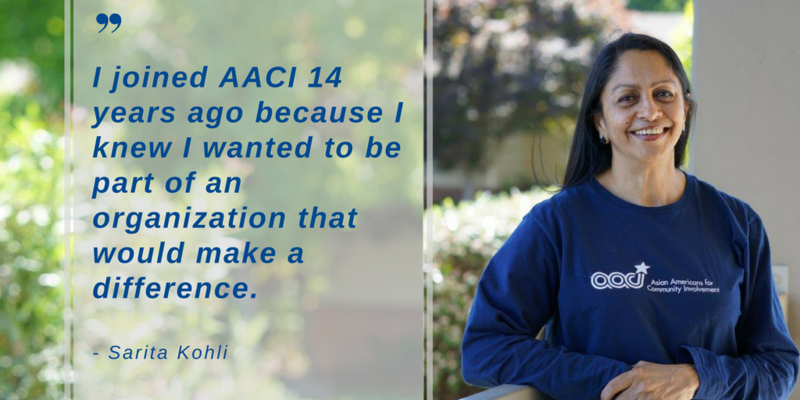 “I joined AACI 14 years ago because I knew I wanted to be part of an organization that would make a difference. The team at AACI is dedicated and passionate to serve and I am honored and excited to have the opportunity to lead in this new capacity. I am looking forward to working with the team to not only continue providing high quality and culturally sensitive care, but to also think strategically as to how we can expand our impact here in Silicon Valley,” said AACI’s new President and CEO, Sarita Kohli. Ms. Kohli will assume the role of President and CEO effective May 16, 2017. AACI was founded in 1973 to meet the health and cultural needs of the incoming immigrants and refugees during the time. Through advocacy and direct services, AACI was able to meet the needs and serve the community. Forty-four years later, AACI now has two clinic sites serving the Silicon Valley and is the largest direct service provider for the Asian American community. Additionally, it has been a leading voice on AAPI issues in the Valley. AACI provides primary care, behavioral health, and wellness services to the community regardless of ethnic background, ability to pay, and immigration status. AACI also has a Center for Survivors of Torture that serves torture victims and refugees, and an Asian Women’s Home that serves survivors of domestic violence and human trafficking. AACI is committed to improving the health, mental health, and well-being of individuals, families and the greater community.